(January 3, 2018; Calistoga, CA)—Napa Valley’s Frank Family Vineyards has been awarded “Winery of the Year” for a second time by Connoisseurs’ Guide to California Wine in the publication’s “Best of 2017” January issue. The periodical, published by Charles Olken and Stephen Eliot, has been reviewing wine since 1974 and reviews thousands of wines each year. The Connoisseurs’ Guide selected Frank Family Vineyards based on its resounding, across-the-board success in 2017, saying, “Of the twenty-two Frank Family wines reviewed this past year, each received starred recommendation with three earning three-star status and thirteen garnering two-star. More remarkable yet, the collection of wines covered the varietal spectrum from Cabernet Sauvignon and Chardonnay to Pinot Noir, Merlot, Zinfandel, Sangiovese and Petite Sirah and, for good measure, included a brace of beautifully crafted sparklers as well.” Adds publisher Olken, “The consistent quality manifest in so many different bottlings is an achievement rarely equaled, and one that makes our choice for this year’s Winery of the Year award remarkably easy.” The publication is available by subscription at www.cgcw.com. Frank Family Vineyards was founded in 1992 by former Disney Studios president, Rich Frank. First constructed as the Historic Larkmead Winery in 1884, the stone building on property is the third oldest in Napa and appears on the National Register of Historical Places. Today, Frank Family owns over 380 acres of vineyards in the Napa Valley, and in 2015 received Napa Green certifications for both land and winery. Frank Family’s reputation for having the friendliest hospitality in Napa Valley has fans flocking to the tasting room on Larkmead Lane, which has been named “Best Napa Winery” by the Bay Area A-List for an unprecedented eight years in a row, making it one of the most popular tasting rooms in wine country. Tastings of Frank Family’s limited-production reserve and sparkling wines which are only available at the winery are priced at $40 per person and are offered seven days a week between 10am and 5pm. Reservations are strongly recommended for visits from Monday through Thursday, and are required for visits on Friday through Sunday. Guests may book a tasting at the winery by calling 1-800-574-9463 or visiting cellarpass.com. 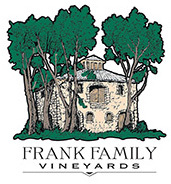 Frank Family’s Napa Valley Chardonnay, Pinot Noir, Zinfandel and Cabernet Sauvignon are distributed nationally. For more information about Frank Family Vineyards, visit www.frankfamilyvineyards.com. For more information please contact Laura Savage at laura@jarviscommunications.com.